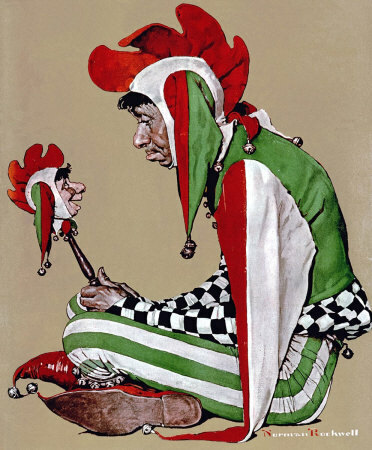 Jester, a Norman Rockwell painting, appeared on the cover of The Saturday Evening Post published February 11, 1939. This is another favorite of Rockwell collectors, a classic enduring image of the world Rockwell painted. Am alternate title for this painting is The Court Jester. This painting was Rockwell's 184th overall out of 322 total paintings that were published on the cover of the Saturday Evening Post. Rockwell's career with the Post spanned 47 years, from his first cover illustration, Boy With Baby Carriage in 1916 to his last, Portrait of John F. Kennedy, in 1963. This was also the first cover for The Post in 1939. In 1939, there were eight Norman Rockwell Saturday Evening Post covers published. The original oil on canvas painting, 31 x 25 inches or 78.5 x 63.5 cm, is part of a private collection. on page 140 of Norman Rockwell, A Definitive Catalogue by Laurie Norton Moffatt. In this painting, Norman Rockwell shows us a split personality. We can see two different emotions at play here. The jester seems very sad. Yet he is looking at his wand. The wand bears his likeness. Yet the miniature head mounted there is laughing. It could even be said that the miniature is laughing at the life size. His clown costume is also interesting. Just look at all the bells. There is even a bell hanging out the back of his trousers. And the bells on the tips of his shoes almost certainly make him feel funny. The red, white and green certainly conveys mirth and frivolity and the black and white checks of his shirt also add to that idea. Jester was only one of 322 Norman Rockwell Saturday Evening Post covers; Here is the list of Norman Rockwell Saturday Evening Post cover illustrations. The printers and engravers hd a hard time with all the gold paint that Rockwell used in this painting. At that time, The Post did not have the capability to print gold under or over other colors. The editor sent the painting back to Rockwell to have him change all the gold paint, probabgly to yellow. After all all those bells printed on millions of copies would have added up to a lot of gold ink..
Do You Have A Great Story, Opinion Or Contribution About Jester?